Calabrian Dynamite Pasta Sauce for sale. Buy online at Zingerman's Mail Order. Gourmet Gifts. Food Gifts. This stuff gathers attention to itself. Government inspectors often hold up our shipment when it gets to shore. 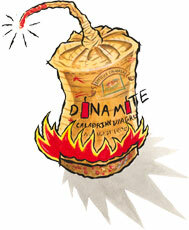 The label says dynamite sauce, Calabrian viagru? What's with this wick coming off the top? I can see them scratching their heads somewhere near the docks in New Jersey. My wish is that one of the inspectors will eventually sneak a jar home for dinner. Then they'll understand what it's all about. The sauce, potent and intense, is composed of tomatoes, mushrooms, and eggplant, blended with extra-hot chiles. While the name may sound like a gimmick, this is a classic combination in Calabria, the province in Southern Italy where it's made. My recommendation is to mix a spoonful at a time with olive oil in a warm skillet, perhaps with a few cooked vegetables. Add cooked pasta directly to the pan and a bit of pasta water. If it's not spicy enough, add more dynamite sauce. Now brace your taste buds. This is going to be a wild ride. I'm sorry to say that the company that made this dynamite sauce is no longer in business. Perhaps another spicy spread might work in its place?